Triedri Murano glass chandelier, 265 pink prism A magnificent Murano glass chandelier, 265 pink triedri on crome frame. 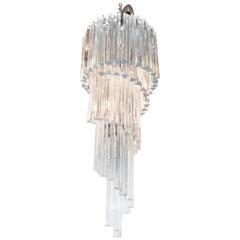 This large midcentury Italian chandelier is truly a timeless Classic. Period: late 20th century Dimensions: 43.30 inches (110 cm) height with chain, 15.75 inches (40 cm) height without chain, 29.50 inches (75 cm) diameter. 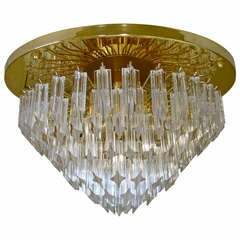 (The measurements are taken with a chandelier mounted, so there can be minimal differences) Dimension of glasses: 96 pink triedri, height 11 inches (28 cm) + 169 pink triedri, height 3.95 inches (10 cm) Light bulbs: 8 light bulbs, E27 dimension (not included in the sale), on request we can replace the lamp holders with those suitable for the American electrical system. Condition: Perfect condition and fully working. 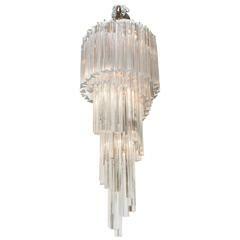 Stunning hard to find Venini "triedi" glass prism flush mount ceiling chandelier. Suspended on beautifully constructed gold-plated frame. Rewired.